This exclusive 6-month programme has been crafted for ALL coaches of women. I want to enable you to create amazing authentic growth in your own life, but then also extend this to the women that you train, coach and serve. 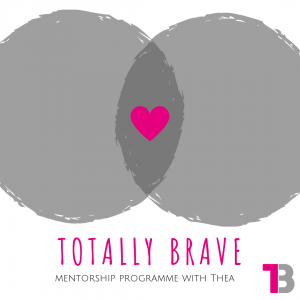 This mentorship programme will provide you with a safe space to work on the intuitive skills, empathy and wisdom that comes from not just the “knowledge” of working with women, but also in creating an incredible space where your women can come to heal, learn and find their own version of health and wellbeing. All this starts with you though. It starts with you being aligned fully with your values and living out life congruently in your own technicolour unique-ness. So this mentorship is firstly for YOU, it is centred ON you. From that foundation we will work on understanding the differences that working with women presents as a trainer and coach – from anatomy, to function, asking difficult questions and everywhere in between! Lastly we add the magic-touch that is seeing our female clients through their lived experiences, and deeply understanding how the work you do with them will profoundly affect their whole lives – whatever age or stage they are at. The Totally Brave mentorship programme will also enable you to work from a trauma-informed perspective with the women you serve in your communities. I believe that this is a TRULY unique approach to the work we do in the physical space and isn’t being taught anywhere else. The initial face-face 3-day workshop weekend will kick us off with a deep dive into all things ‘woman’. Following on from that will be 5 months of fortnightly 1:1 and group Zoom/Skype calls. You will have regular access to me for your own personal growth developments, business evolutions and to answer specific questions you might have about the individual work you are doing with clients. My aim is that you finish your 6-month mentorship utterly confident in the work you are doing with women, brave with your words and kind with your actions. *Depending on your experience of working holistically with women there may be some preparation work required before our weekend workshop and this will be discussed with you when you confirm your place. For my first year of mentorship programmes there will be a special investment price of AUD$999 and payment plans are totally manageable. Places will be strictly limited to 8 people per programme as the nature of this work lends itself to small, intimate groups.